The Bell Warriors Football Program introduced a Food Bank Donation Program this Spring to further instill the Warriors’ commitment to our community in our families, supporters and players. “Our community shouldn’t be defined by our daily routines. A vibrant community is the result of shared ideals, mutual respect and selfless generousity. We are committed to ensure the values we encourage on the field are practiced off the field by our Warriors. 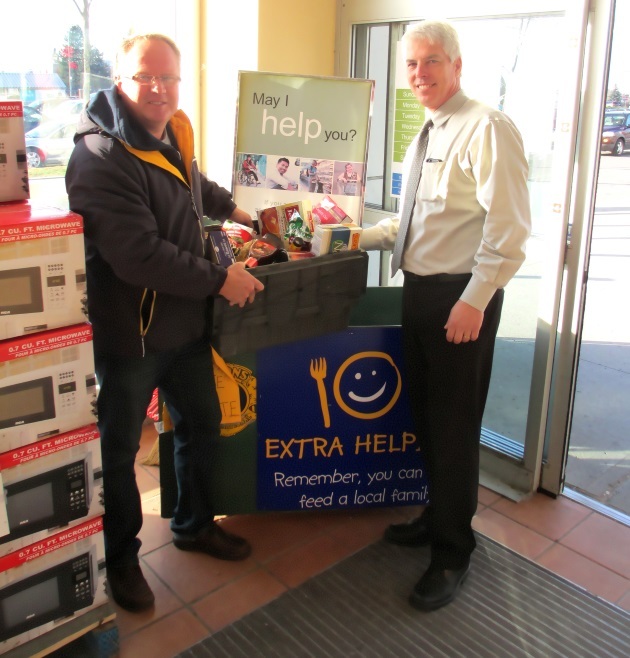 We couldn’t be happier with their commitment to give back to their community with our new Food Bank Donation Program.” – Paul Stewart, Bell Warriors Football Club President. 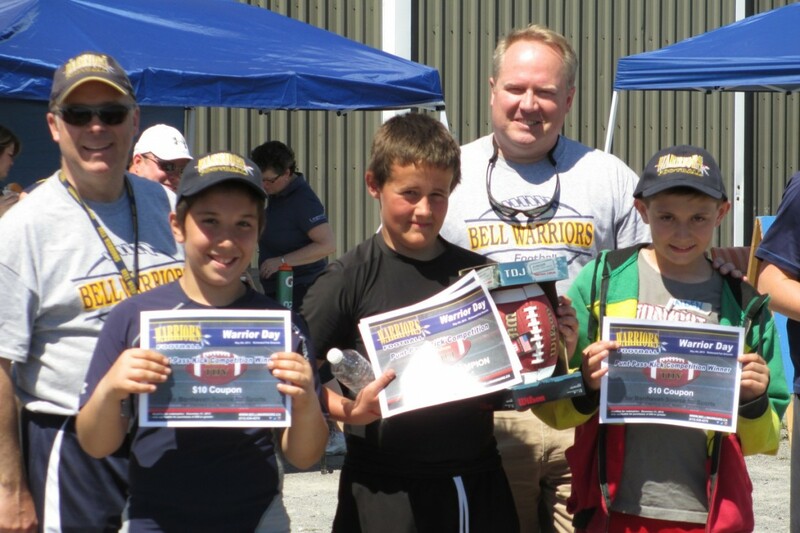 Since 1955, the Bell Warriors Football Club has offered football programs for boys and girls ages 8-16 in the communities of Britannia, Bayshore, Bells Corners, Richmond, Munster and Stittsville. For more details on how you or your business can show your support for the Bell Warriors Football Club, go to the Sponsorship Opportunities page at www.bellwarriors.ca or email president@bellwarriors.ca. It’s happened again. 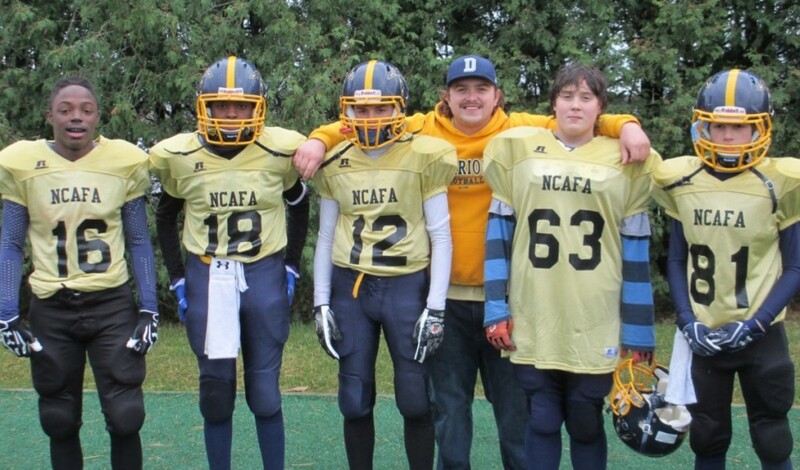 Two Bell Warriors Bantam players (ages 15-16) have been named NCAFA Players of the Week for Week 5 of the 2013 tackle football season. Dylan Parry has been named NCAFA’s Overall and Offensive Player of the Week on the strength of a jaw-dropping performance which saw Dylan score 3 TD’s. Sheldon Thomas, also of the Bell Warriors, was named NCAFA’s Defensive Player of the Game in Week 5 due to his numerous tackles and interception which was returned for a touchdown in the 57-0 Warrior win Sept 21st against the Kanata Knights. In addition to Dylan and Sheldon’s honours, week two saw Warriors’ Quinn Stewart (QB) and Andrew Beattie (LB) take home similar honours (both from Richmond). In week three, Stittsville’s Kurtis Schaefer also won NCAFA’s Player of the Week. “I’ve had the privilege to coach Sheldon every second year that he’s been with the Warriors since his first year at tyke (8 to 10 year olds). He’s always has a smile and has always been willing to do the jobs no one else would. He’s a great team player. Dylan Parry is one of the most modest athletes I’ve coached despite the fact that he may be one of the best receivers I’ve ever been involved with and now he has evolved into a jaw-dropping running back. He’s an undeniable talent and like Sheldon, he is a pleasure to coach. They reflect what NCAFA and the Warriors are all about and I couldn’t be happier for either boy for being this week’s NCAFA Player of the Week.” – Paul Stewart, Bell Warriors President. 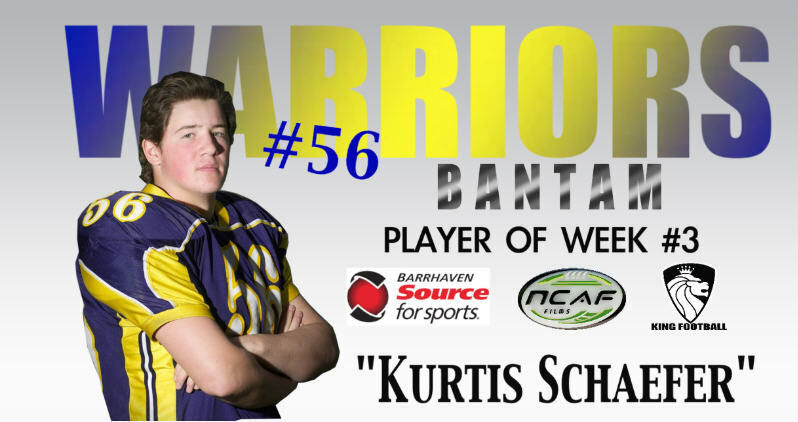 Standout Bantam MLB and Captain Kurtis Schaefer is named NCAFA Player of the Week in week 3 of the 2013 NCAFA Bantam Season. 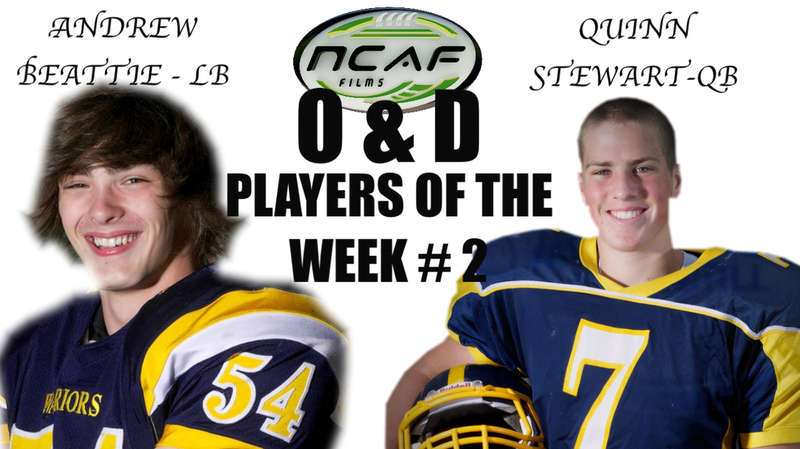 The overall NCAFA Player of the Week and Offensive Player of Week in week two of the NCAFA season has been announced and the honour goes to Bell Warrior Bantam captain and QB Quinn Stewart on the strength of his 3 throwing TD’s and 2 running TD’s this past weekend. 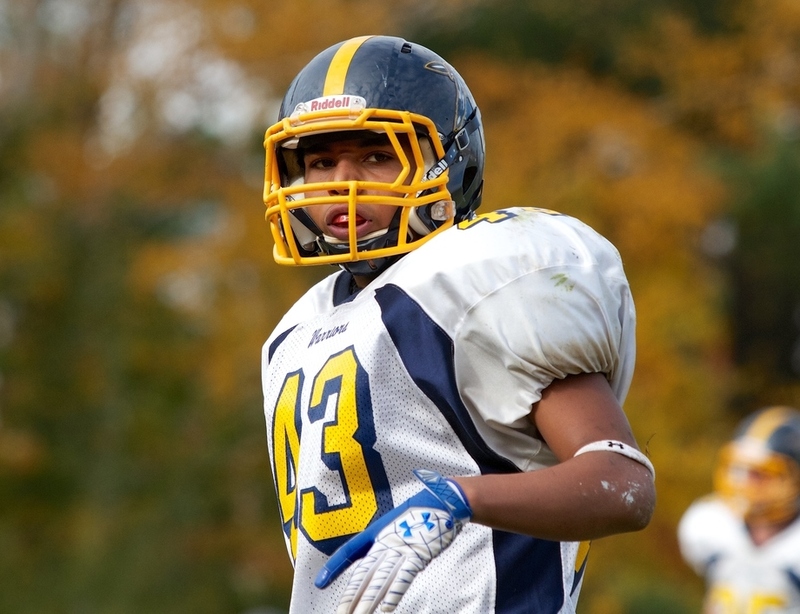 Defensive Player of the Week is dominant first-year Bantam MLB Andrew Beattie. What a day! Big crowd of like-minded Warrior supporters hit the links at the Richmond Centennial Golf Course for a great day of fun. This has been going on for decades thanks to the vision of Jim Wagdin our immediate Past-President. Tim Sheahan, VP of Operations, is running the program now and we had an excellent day. THANKS to our many parents who lined up gifts and to our many generous supporters who donated prizes. We had a first this year a 3-Way Tie! 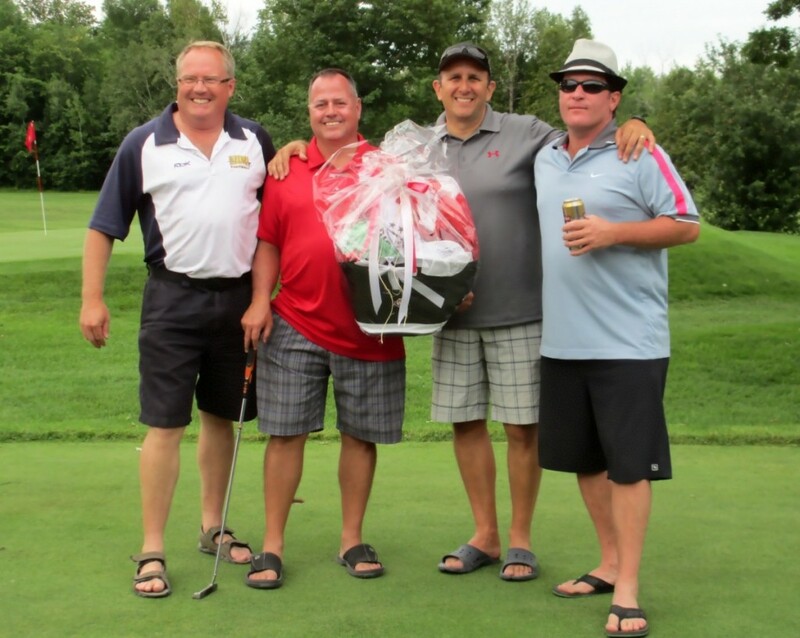 The put-off came up with an undisputable winner – TEAM PAPALIA: Joe Papalia, his faher (the ringer), Dan Crabtree and Richard Baylin. 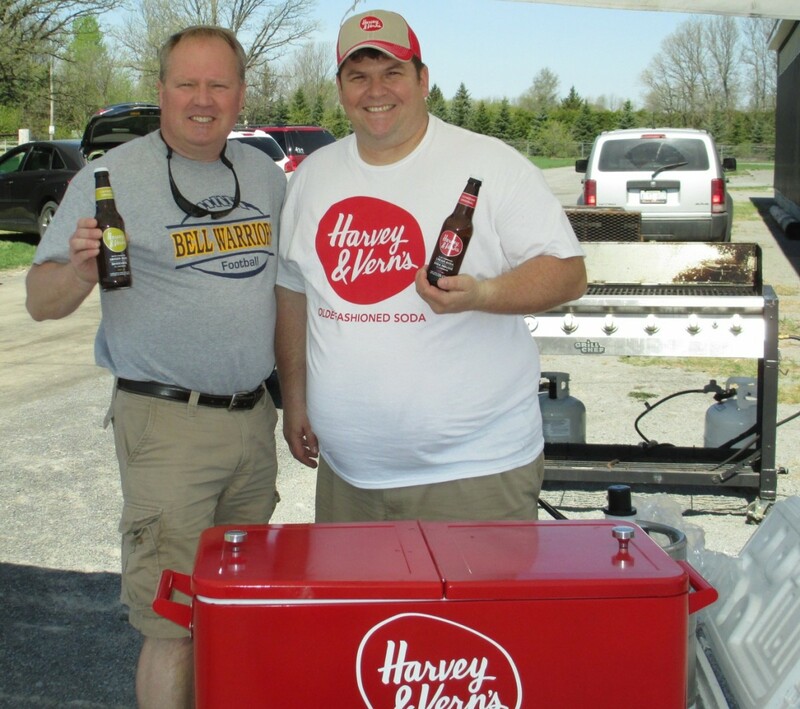 A big THANK YOU to the Big Rig Kitchen and Brewery for donating the awesome Winning Team Prize! CONGRATS LADS!!!! For those that took in the first Edmonton Eskimos exhibition game of the 2013 season on TSN’s Friday Night Football, you probably enjoyed a spirited match. Nice to have football back on the tube. For local football fans, the return of football had added significance. The odds of a Canadian football player making it all the way to the CFL are slim at best. To have two local players, who both played for the same minor football team, make it to the football summit and play for the same CFL team is unheard of. Well it happened this past Friday, June 14th with the Edmonton Eskimos for Scott Mitchell of Ottawa and Kyle Norris of Stittsville. Where did they start their football careers you may ask? 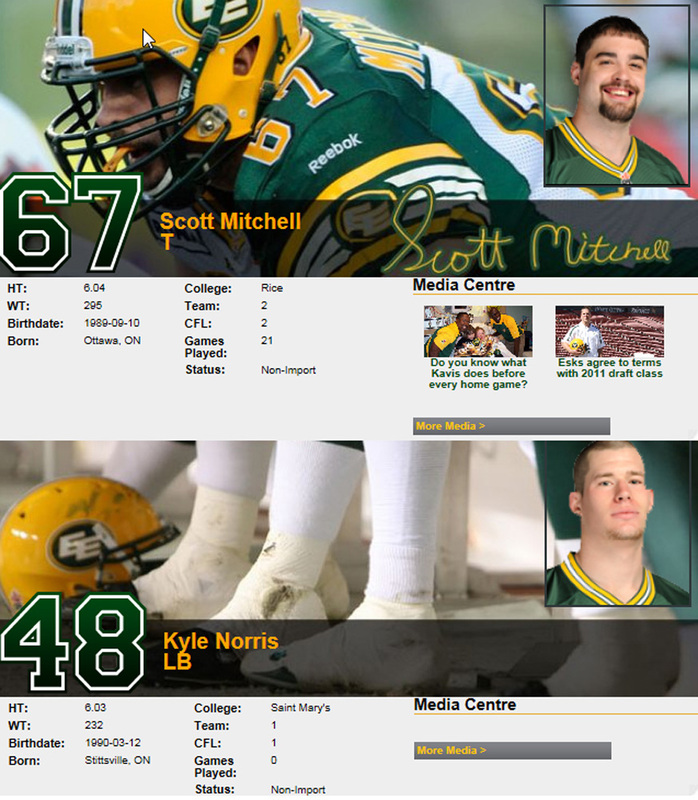 Ends up both Eskimos players started the football playing days for the our Bell Warriors Football Club. The Bell Warriors are still looking for more players for the 2013 Football Season. With all 4 clubs playing in the 2012 Championships, the Warriors are excited for the upcoming season. 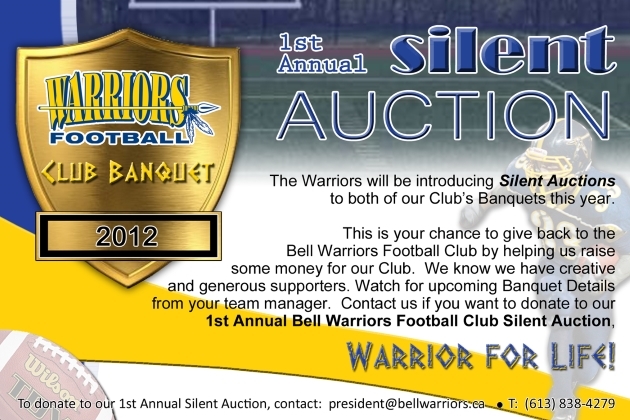 For more details, contact the Warriors at president@bellwarriors.ca. 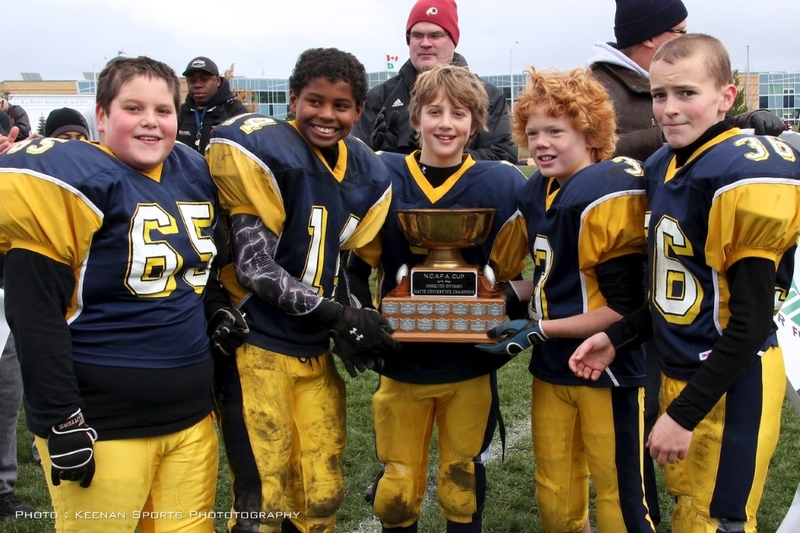 Since 1955, the Bell Warriors Football Club has offered football programs for boys and girls ages 8-16 in the communities of Britannia, Bayshore, Bells Corners, Richmond, Munster and Stittsville. The Bell Warriors Football Club were part of a 200+ player contingent representing the National Capital Amateur Football Association (NCAFA) at the launch of Ottawa’s new CFL franchise – the Ottawa Red Blacks. 15 Bell Warrior players joined Warriors President Paul Stewart to represent the local football club at the Ernst & Young Centre Saturday afternoon. 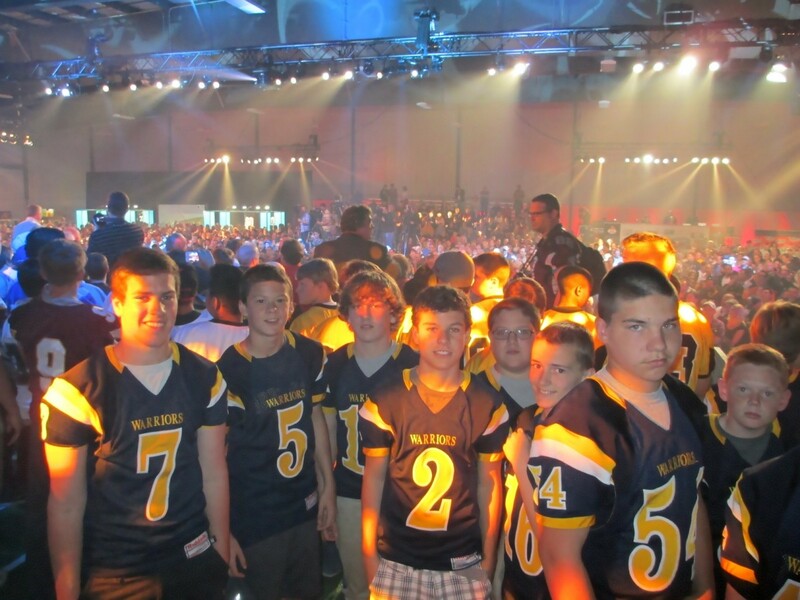 More than 3,000 were on hand to celebrate the return of the CFL to Ottawa. 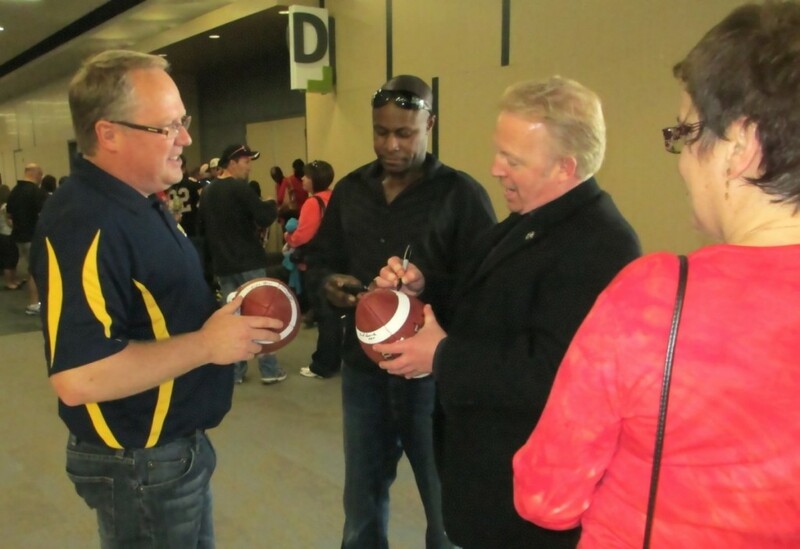 The Warriors also made the most of the opportunity to approach Ottawa Rough Rider and Renegades alumni to sign CFL footballs to help raise important dollars for the football club. “We’ll be offering up the signed memorabilia at our Bell Warrior Silent Auctions in January. 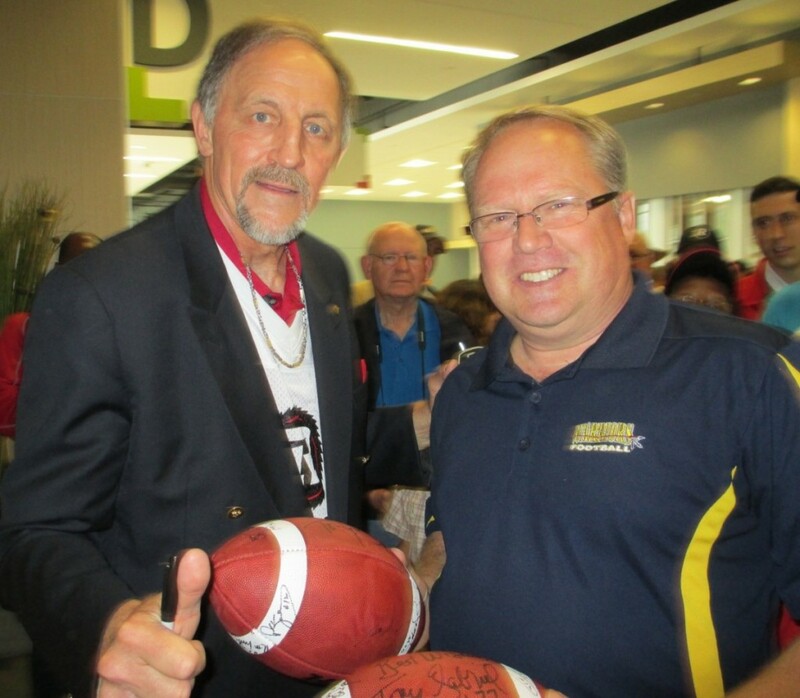 In addition to signatures from ex-CFL greats like Russ Jackson, Jerry Organ, and Tony Gabriel, Ottawa Red Blacks GM Marcel DesJardins and co-owner Jeff Hunt signed to show their support of NCAFA, the Warriors and amateur football. It was a huge day for our city and the football community”, continues Mr. Stewart. President Paul Stewart with CFL Hall of Famer and Ottawa Rough Rider great Tony Gabriel. Paul Stewart (Bell Warriors President) with Ottawa REDBLACKS co-owner Jeff Hunt. Since 1955, the Bell Warriors Football Club has offered football programs for boys and girls ages 8-16 in the communities of Britannia, Bayshore, Bells Corners, Richmond, Munster and Stittsville. 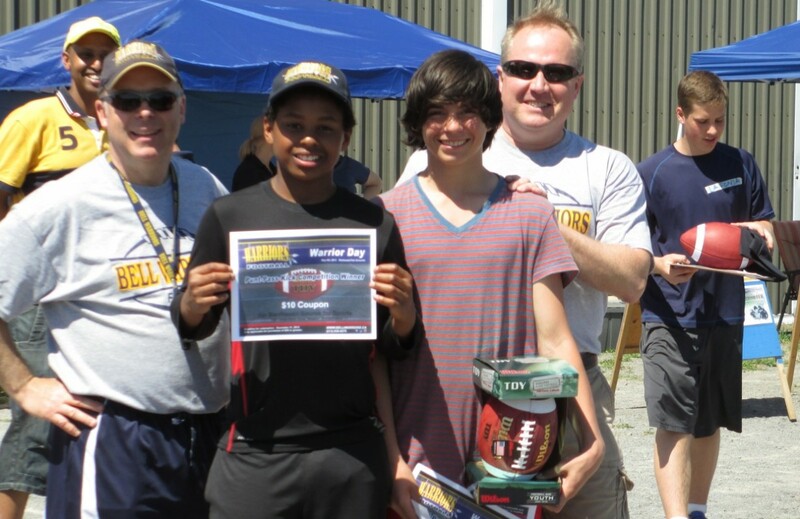 Close to 100 youth interested in playing football came out to the Richmond Fair Grounds for the 2013 Bell Warriors Football Club’s 2nd Annual “Warrior Day”. 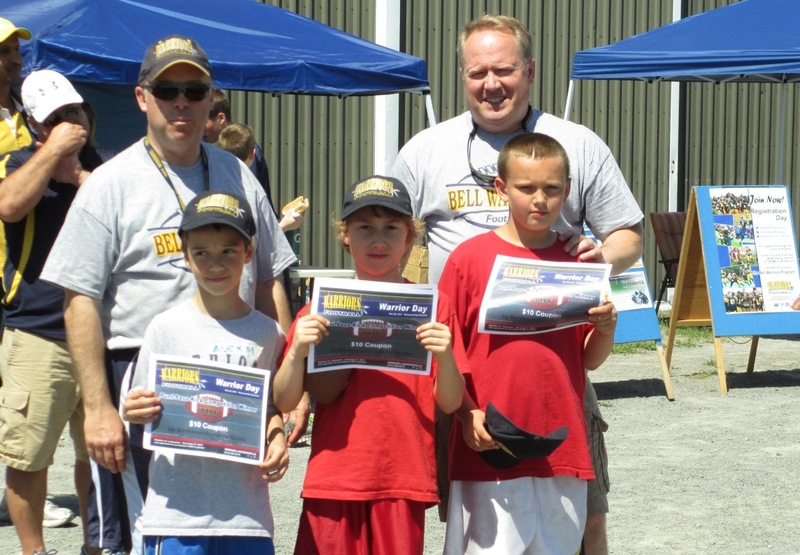 The football clinic also included registration for the upcoming 2013 tackle football tryouts and a Punt-Pass-Kick competition. The Warriors have also added some value-added programs this year for their supporters which were launched at the event. The Club introduced their Hand-Me-Down Program which encourages supporters to recycle their cleats and Warrior Wear clothing. Also new this year is the Warrior Foodbank Program. 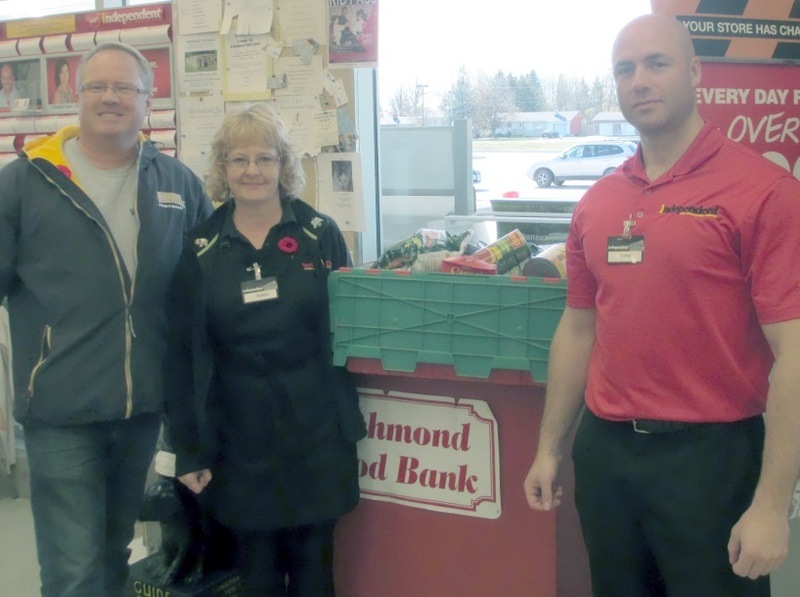 At every practice, event and game this year the Bell Warriors will be accepting non-perishable food for local food banks. Tryouts start just after the long weekend in May and it is not too late to register to try out and have some fun playing football. For more details, go to www.bellwarriors.ca or email president@bellwarriors.ca. In October of 2012, Josh Sacobie joined the Carleton Ravens football coaching staff as Receiver Coach and Manager of the Ravens community outreach programs. Josh brought firsthand knowledge of CIS from his experience as an All-Canadian student-athlete. Josh had an impressive five-year career as quarterback of the University of Ottawa Gee-Gees and was a 2008 Hec Creighton CIS Player of the Year finalist, along with being named OUA Player of the Year. Josh and a number of Carleton Ravens players the Warriors at our 3rd week of our Warrior Winter Workouts to have some fun with our players and lend their expertise. “The Ravens will be fielding their first team in years this fall and are proving their commitment to support the football community. It is all about inspiring young people to challenge themselves and to grow our great sport. Having the Ravens join our players and coaches is an awesome gesture and one that the Warriors are tremendously excited and grateful about. In addition, the Ravens are starting a new program for players 8-14 who haven’t been exposed to football before. 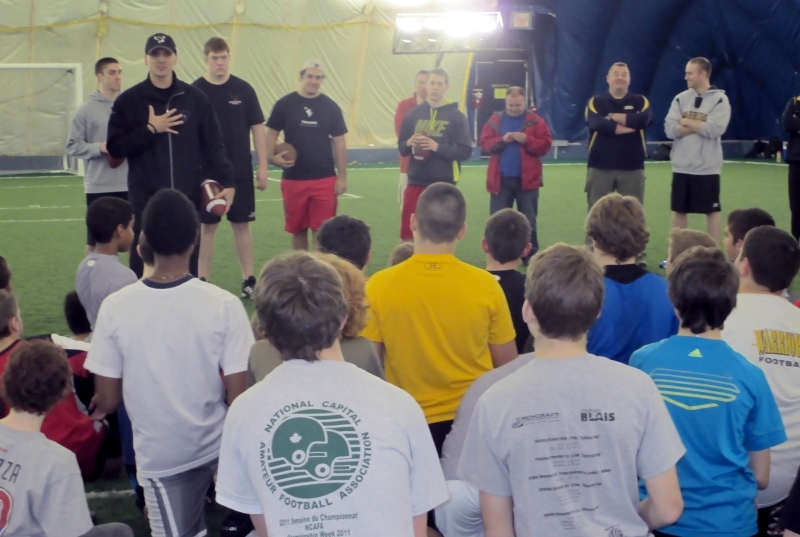 The Jr. Ravens program is destined to be a big hit in the Ottawa region and will continue efforts to expose youth to football. Football in the region is clearly growing like never before.” – Paul Stewart, Bell Warrriors Football Club President. Big THANKS to Josh Sacobie of the Carleton Ravens and players Cameron Stewart, Stefano Napolitano and Tyler Young (both Warrior Alumni) for giving back at the Warrior Winter Workouts. The Bell Warriors Football Club are proud to announce that Charlie Keenan has been selected as the Most Outstanding National Capital Amateur Football Association (NCAFA) Bantam Graduating Player. 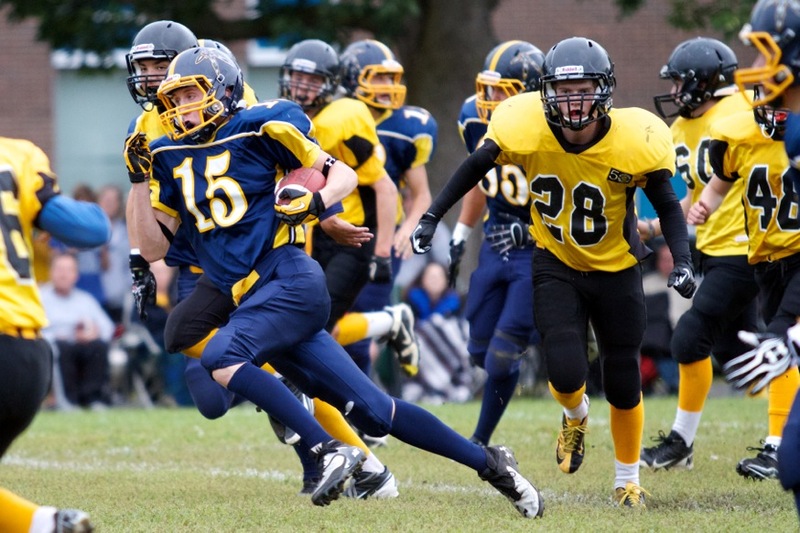 NCAFA is the largest amateur football association in Canada. 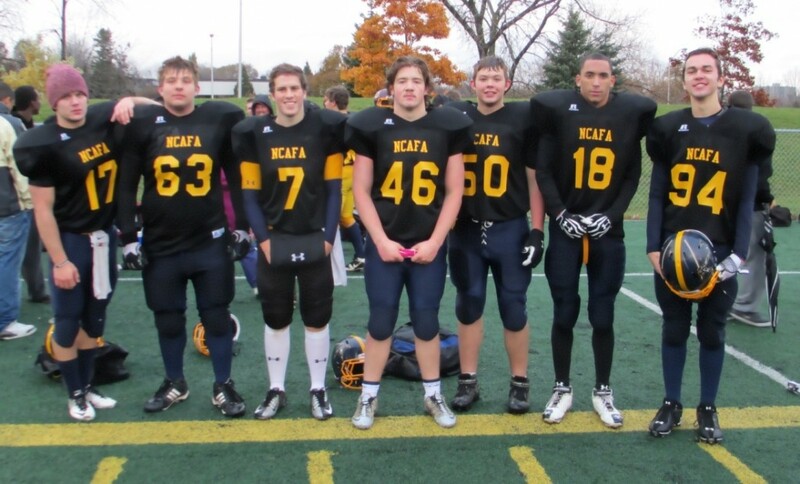 Charlie recently played the NCAFA Bantam All-Star Game (on behalf of the Warriors) and was named the Offensive MVP of the 2013 All Star game. He’s a great young man and his commitment is compelling. 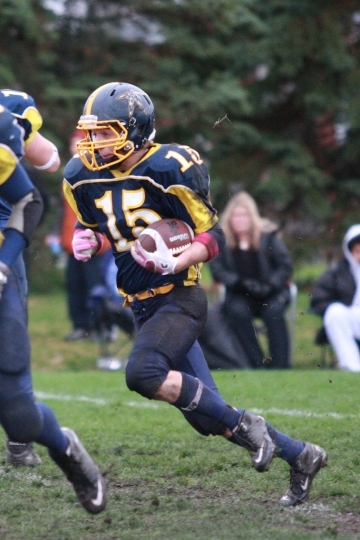 Charlie Keenan – 2012 Bell Warriors Bantam Coaches’ Choice Award Winner and Winner of the NCAFA Bantam Bursary. 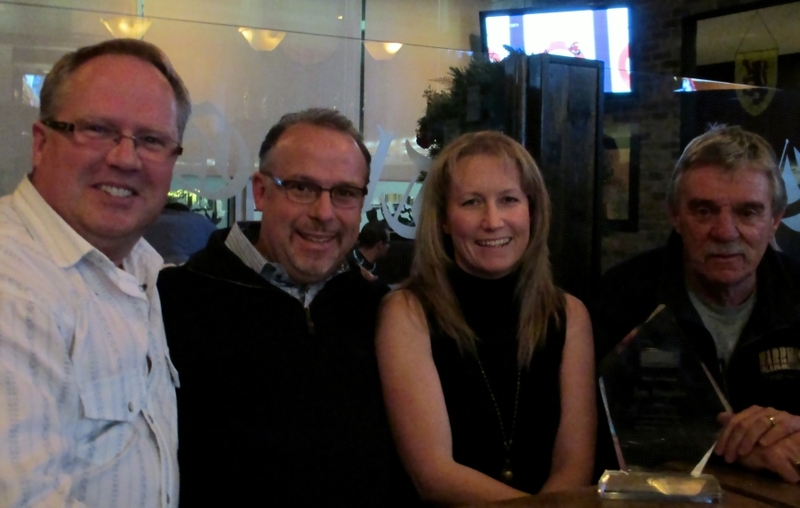 Jim Wagdin was bestowed two honours last night at the Bell Warriors Volunteer Appreciation Night. The Warriors have created a Bell Warriors Hall of Fame and the first inductee is Jim Wagdin of Richmond. Going forward, the Bell Warriors post-secondary bursaries will be known as the Bell Warriors Jim Wagdin Scholarships. Each year since Mr Wagdin introduced the Bell Warriors Scholarship Program, the Warriors have given up to two $1,000 scholarships. The three main selection criteria are Athletic experience, Academic achievement, and Community volunteerism. 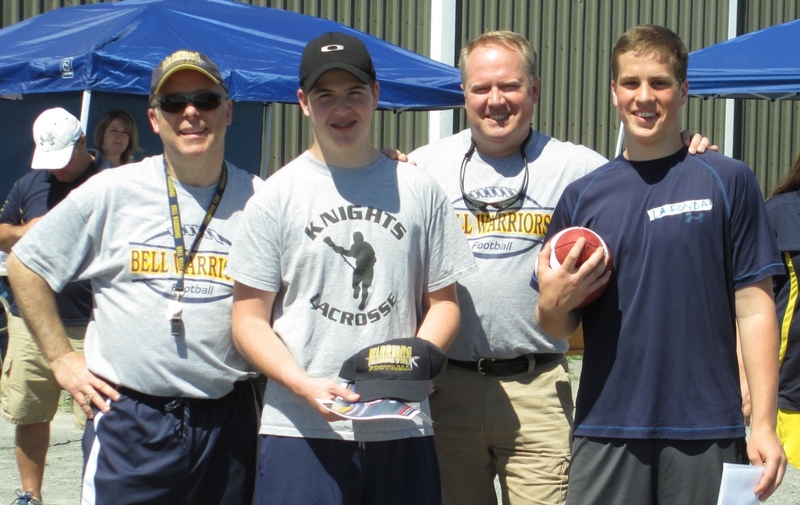 In all, the Warriors have given out $26,000 to ex-Warrior players in support of their scholastic goals and aspirations. On and off the field, the Warriors stand by our players and believe in giving back to our community. A committee will be struck in the New Year to source out a suitable location for the Bell Warriors Hall of Fame. Jim started with the Warriors Club in 1989. Over his 24 years with the Warriors, Jim was involved with mentoring over 3,000 young boys and girls and won many Regional Championships. 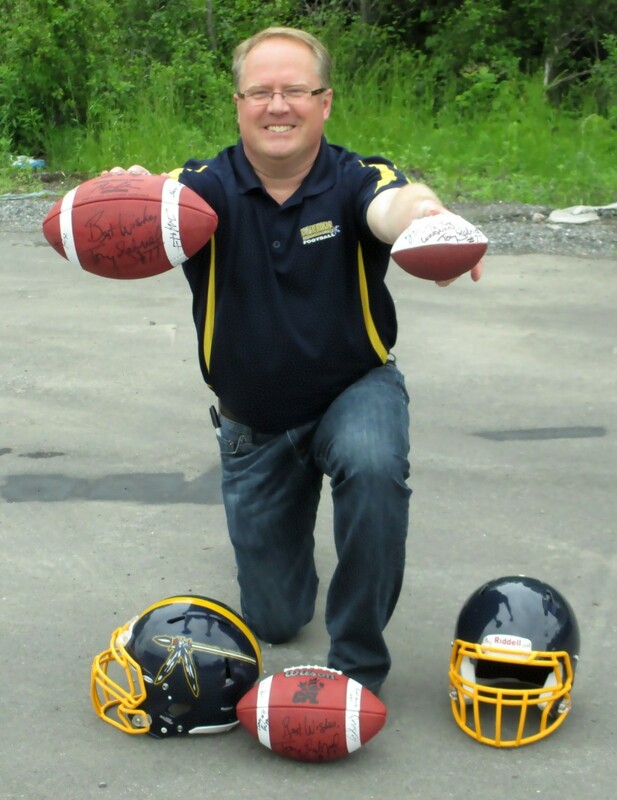 Jim also sat on the NCAFA (National Capital Amateur Football Association) Board of Directors. Jim was a VP on the Board and was the Chair of their Disciplinary Committee. 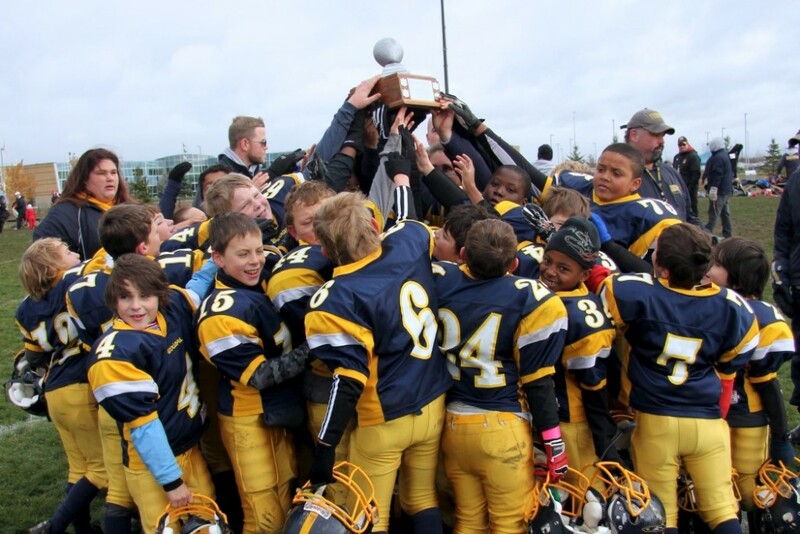 Tyke: The Bell Warriors Tykes played the biggest game of the year and the defense pulled through to win the Chorney Conference Championship over a tough Nepean Redskins squad 14-12. Led by defensive players Max Johnston, Andrew Decarie and Shyreek Phillips, who made several key tackles throughout the game, all led by example and played through some minor injuries. Offensively,the Warriors team played confidently with James Lawlor and Trey O’Brien scoring the two Warrior TD’s on impressive runs. Mosquito: The Bell Warriors mosquito squad held off a tough Bengals side to capture the Chorney Conference Championship Cup this past weekend at Millenium field, the fourth straight Mosquito Division City Championship. Another multiple touchdown performance from Joshua Streng with strong performance at Quarterback from James Keenan. The defence was led once again by Malik Yusuf and Shane Forsyth. Pee Wee: The Bell Warriors Peewee Team, in the third straight A-Cup appearance by the Warriors, fought hard against The North Gloucester Giants in a battle of the leagues 2 best offensive teams. Neither side giving in completely, bend but don’t break, the game needed OT to decide the outcome. The Giants prevailed 26 – 20 , with Dilan Parry (The MVP of the game ) amassing 266 yards rushing in a losing effort. Bantam: The Bell Warriors Bantam club just didn’t have enough to shut down the undefeated Myers Riders and came up short 40-2. 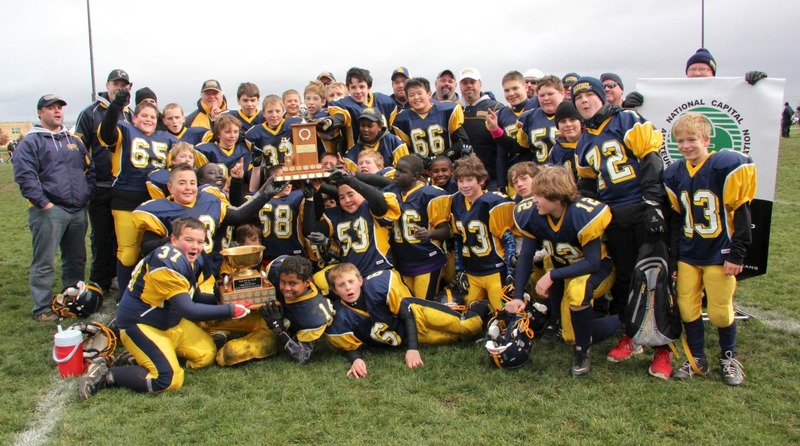 The Warriors Bantam Club had an impressive 7 an 1 season and won both their sudden-death playoff games to appear in the A-Cup Gilchrist Conference Championship. As had been the case all season long, Mike Hoecht, Charlie Keenan and Jesse Skucas ran hard for the Warriors. Defensively, Josh Bailey and Mitchell Henselwood led the Warriors throughout the game. Combined, our 4 levels had the best record in the league this year. We were #1 in the league for Points For (1205), #1 for Points Differential (+773 points), #4 for Points Against (432), #1 for Average Points Per Game (38) and all 4 levels can boast about winning seasons. With all 4 clubs competing in the City’s Championship and our Tykes and Mosquitos winning, this has certainly been a banner year for the Warriors. The Bell Warriors partner with Bel-Air at the Midget level (ages 17-19) and the team is called the Bel-Air Noresmen. 14 Ex-Warriors played for the Norsemen this year and they went on to win the A-Cup Midget Championship over the Nepean Redskins 4-3. A big congratulations goes out to the long-time Bel-Air President John Smith and the Norsemen’s fantastic head coach Tony Violante! WELL DONE! 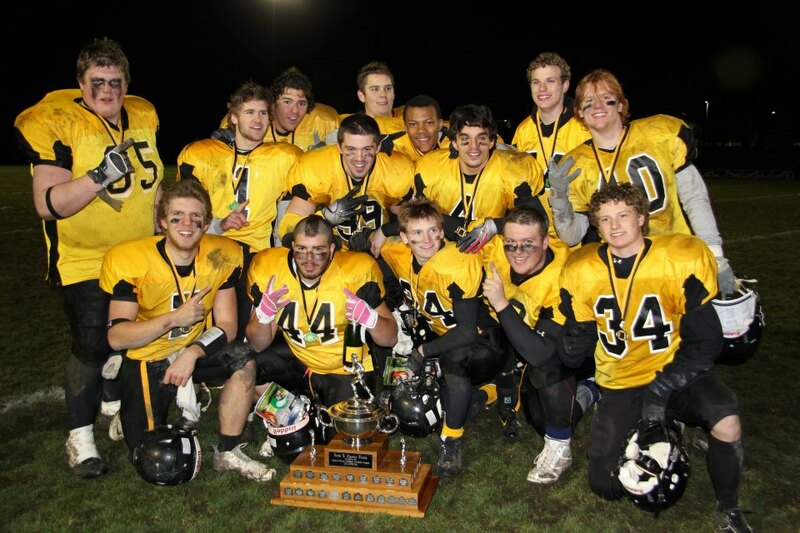 14 Warrior Alumni are part of the 2012 NCAFA A-Cup winning Bel-Air Nosemen line-up. CONGRATS LADS!